Document scan was taken from Library of Congress microfilm reel of the Wilson Papers. WWPL volunteers transcribed the text. 4686, August 7, 12 noon. 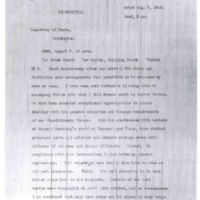 Sharp, William Graves, 1859-1922, “William Graves Sharp to Robert Lansing,” 1918 August 7, WWP25118, World War I Letters, Woodrow Wilson Presidential Library & Museum, Staunton, Virginia.